In this on-demand webinar, SolarWinds and Kenson discuss how distributing patches for known vulnerabilities could save you from having to deal with the risk of exploitation. Agencies and organisations need to ensure their systems are up to date with both Microsoft and third-party patches, or they risk falling victim to attacks that could be avoidable. 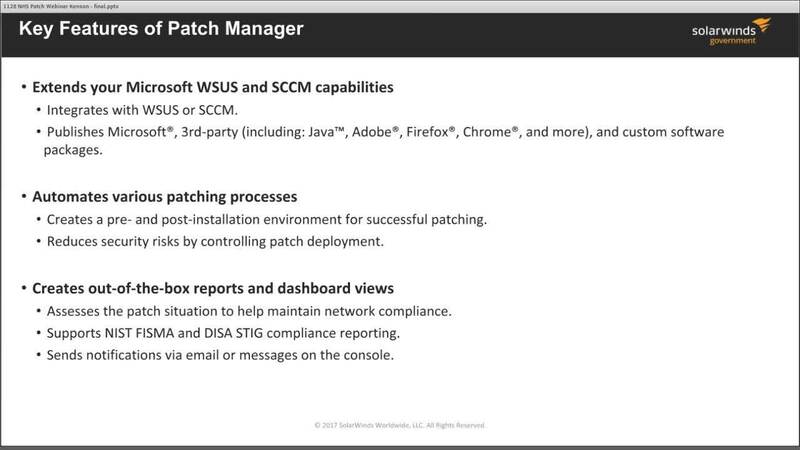 SolarWinds® Patch Manager is an intuitive patch management software that extends the capabilities of WSUS and SCCM to not only patch Windows® servers and workstations and Microsoft® applications, but also other third-party applications that are commonly exploited by hackers.